“For us it is a big motivation to be named in several categories on the FOCUS list”, WW+KN managing partner and tax advisor Matthias Winkler said. 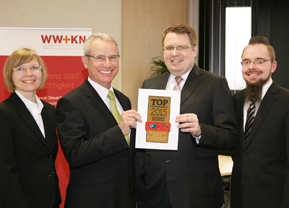 On the nationwide list with tax consultancies from Aachen to Zwickau, also the WW+KN group was named. The list of the leading German tax consultancies was published in the special issue February/March 2015 of the magazine FOCUS. According to FOCUS every tax consulting office, which is named on the list, gets the award “leading tax consultancy 2015” for its consulting area or its sector. The WW+KN group got the title in several categories. The list of Germanys leading tax consulting offices was researched by the Institut Statista in Hamburg. According to FOCUS the ranking is based on the recommendation of more than 1700 tax advisors and auditors. Totally around 7300 tax advisors and auditors in the management level of 3000 different tax consulting offices were asked to take part in the survey. 20 percent of the asked persons participated in the survey.